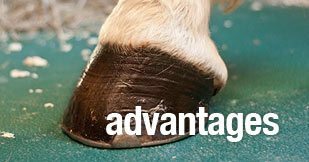 Heavy rubber horse stall mats have been the standard for the equestrian market for over 100 years. Can you imagine lifting a single mat weighing 30 lbs. as opposed to a rubber mat weighing 100 lbs? Frelonic Lightweight Interlocking Stall Set (12'x12') weighs only 180 pounds as opposed to the typical rubber set which weighs 600 pounds. Yes, a 420 pound difference. The lightweight interlocking horse stall mats were initially developed for the European market nearly 20 years ago. The U.S. equestrian market created such a high demand for our product that Frelonic decided to expand its market nearly 10 years ago with its Lightweight Interlocking Stall Mats. This was completed after years of researching the needs for the equestrian market. 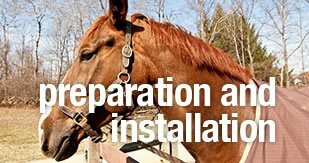 As a result, our interlocking system, color, design and light weight mats met the majority of owners and trainers desires throughout the country. This was all completed without compromising any of the mats specifications or its durability. 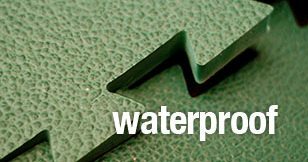 Frelonic Lightweight Interlocking Stall Mats provide a more comfortable and softer bed for your horse than the hard surface rubber mats. © 2011 Frelonic. All rights reserved.